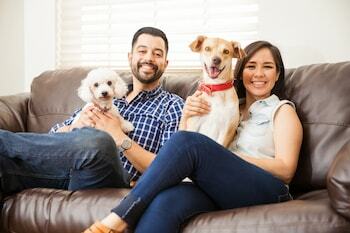 If your pet is of non-aggressive breed, we may have a property that might work for you! We are pleased to work with any qualified applicant that has a mature, well behaved, non-aggressive breed dog. Most of our properties are pet friendly and this information will be listed in the ad for each house. These terms are largely based on the comfort level of the property owner and the restrictions they decide for a pet to be considered. Some smaller properties are suitable for residents with a cat, while other properties may not allow cats due to allergy issues of the property owner. If your pet is over one years old, and of non-aggressive breed, we may have a property that might work for you! Pets under one years of age will not be considered and breeding of any pets is not allowed on our properties. At Leading Edge we require every animal to go through our professional screening process. The fee for this is $20.00 for the first pet profile and $15.00 for each additional pet in your profile. These application fees are paid directly to our 3rd party vendor conducting the pet screening. This screening is part of our application process and any house application received that lists a pet(s) must complete this in order to move forward with the rental application. It is the sole obligation of the applicant to get their pet approved prior to submitting the rental application, please be prepared to submit photo along with your request for approval. Non-qualifying pets may result in denial of rental application. Here is a list of breeds that are considered aggressive by major insurance companies. While we understand that your pet may be sweet and gentle, neither Leading Edge Property Management and Real Estate nor our clients are willing or able to take a risk renting to an animal that is considered a statistical liability. The overall strength of your qualifications weighs heavily on the consideration to approve your pet, as does the age, weight and breed of the pet. The pet application must be completed. All approved pets are subject to a $25.00 pet acceptance fee, per pet. At Leading Edge, we conduct at least one pet inspection on pet approved units per year and the fee is $125.00 per inspection, due at the time of lease signing. We collect a minimum of $300.00 per pet which is added to the security deposit.